Preparation time: 15 minutes. Cooking time: 45–50 minutes. Brown ground round in a large, nonstick skillet. Drain off any fat. Stir in remaining ingredients. Cover and bring to a boil over high heat, reduce heat to medium and simmer 30–35 minutes, or until rice is tender; stir periodically. 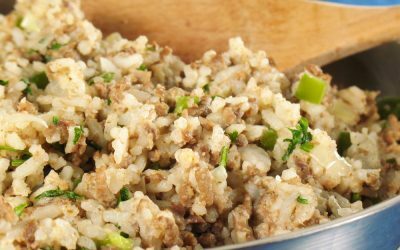 Exchanges per serving: 1 1/2 starch, 1 nonstarchy vegetable, 2 lean meat. Carbohydrate choices: 2. Tami Ross is a Diabetes Nutrition Specialist and Certified Diabetes Educator in Lexington, Kentucky.